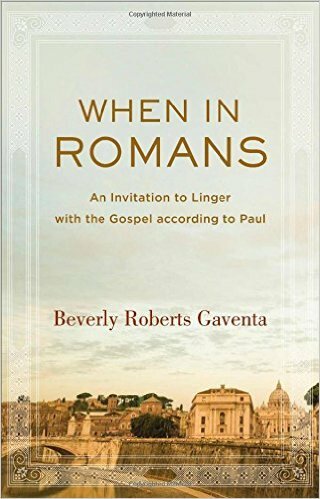 Hopefully, these introductory comments can help us better appreciate the usefulness of Beverly Roberts Gaventa’s brief and illuminating book, When in Romans: An Invitation to Linger with the Gospel according to Paul. In it, she reflects theologically on the significance of Paul’s letter for those who might not otherwise know where to start. As Gaventa explains in the preface, “This book on Romans is intended for people who would not normally read a book about Romans” (p.xiii). She wants her audience to get off the tourist path and explore the larger, more expansive world of the letter because Romans “confronts us with the universal, cosmic horizon of the good news” (p.3). The main body of the book is composed of four chapters with titles like “When in Romans… Watch the Horizon” and “When in Romans… Consider Abraham”. These titles function as helpful guidelines for those learning how to get around in Paul’s letter for themselves. As she works through the letter with her audience, Gaventa does engage (at least in the footnotes) with some of the more important scholarly issues like the translational and interpretative debates surrounding the phrase dikaiosynê theou, but for the most part she stays out of the weeds. Obviously, it’s not that Gaventa thinks the individual and corporate dimensions of salvation are unimportant (p.46). It seems to me that for her, something is lost if our understanding of salvation ends there. She wants her audience to see that these individual and communal aspects of salvation are taken up and included within an even larger, more expansive vision of salvation: “What we… need to hear is Paul’s understanding that the gospel encompasses the cosmos, the whole of creation—all the way out and all the way down in human life” (p.46). I would suggest that from her point of view, the redemptive action of God in Christ can be seen as the in-breaking of salvation, the trampling of death by death, and the inauguration of God’s renewal of all creation. Much of what Gaventa presents in this book will be somewhat familiar to those already acquainted with the writings of scholars like J. Louis Martyn, J. Christian Beker, Ernst Käsemann, and other advocates of the “apocalyptic” approach to Paul. It seems safe to say that Bird’s description resonates quite well with the major themes of Gaventa’s work in When in Romans. Before we shift to the conclusion, I do want to briefly examine the somewhat contentious issue regarding how advocates of the apocalyptic in Paul understand the Apostle in relation to other forms of Second Temple Judaism. For some apocalyptic Pauline scholars, there is stark discontinuity between Paul’s past and present, to the point that Paul ends up repudiating Israel’s history and minimizing the importance of any overarching covenantal narratives. However, it seems to me that the categories of apocalyptic and covenantal in Paul don’t always have to be held in opposition. The apocalyptic approach highlights important Pauline themes that others have too-often missed, but I side with Bird when he claims that, “Properly understood, an apocalypse is the climax of God’s saving purpose for his people, not a whole new start, and certainly not a repudiation of the past” (2016, p.121). Similarly, Richard Hays gives some needed nuance when he writes that, “God’s ‘apocalyptic’ act in Christ does not simply shatter and sweep away creation and covenant; rather, it hermeneutically reconfigures creation and covenant… in light of cross and resurrection” (2014, p.205). Within this more nuanced, moderate framework, I think the apocalyptic approach still has an important contribution to how we understand Paul. Regardless, I’d be very interested to listen more to how Gaventa thinks about these matters. When in Romans is a lively and conversational introduction to Paul’s letter to the Romans, oriented especially to those without much experience working through the text. My hope is that it will lead many to read Romans slowly and with a fresh perspective, straying from the most commonly read passages to spend more time with the letter as a whole. For those already familiar with Paul’s writings and possessing an abiding interest in Pauline scholarship, this book also gives a good sketch of what comes to the forefront when Paul’s letter to the Romans is approached with an apocalyptic lens. One thing I missed while reading the pages of When in Romans was extended engagement with other Pauline scholars and interpretive perspectives. I’m not without hope, though, because Gaventa is also composing a larger academic commentary on Romans. The glimpse this little book gives of her perspective on Paul leads me to anticipate that her upcoming commentary will make a refreshing and thought-provoking contribution to the ongoing conversation that takes place as the Church wrestles with Romans and lives in light of it, along with the rest of the biblical canon. I’m looking forward to reading it. Bird, Michael F. An Anomalous Jew: Paul among Jews, Greeks, and Romans. Grand Rapids, MI: Wm. B. Eerdmans Publishing Co., 2016. Gorman, Michael J. Apostle of the Crucified Lord: A Theological Introduction to Paul and His Letters. 1st Ed. Grand Rapids, MI: Wm. B. Eerdmans Publishing Co., 2004. Hays, Richard B. “Apocalyptic Poiesis in Galatians: Paternity, Passion, and Participation.” In Galatians and Christian Theology: Justification, the Gospel, and Ethics in Paul’s Letter, edited by Mark W. Elliott, Scott J. Hafemann, N.T. Wright, and John Frederick, 200-219. Grand Rapids: MI: Baker Academic, 2014. Peterson, Eugene H. “The Letter of Paul to the Romans.” In The Life With God Bible: with the Deuterocanonical Books, edited by Richard J. Foster, Gayle Beebe, Lynda L. Graybeal, Thomas C. Oden, Dallas Willard, Walter Brueggemann, and Eugene H. Peterson, 261-265. New York, NY: HarperOne, 2009. This entry was posted in Book Reviews and tagged Apocalyptic Paul, Beverly Roberts Gaventa, Book Reviews, New Testament, Paul, Romans, theology by joecrow91. Bookmark the permalink.